I'm still surprised at the number of people who assume Caesar Dressing is Vegan (or even Vegetarian). I do realize it's all too easy to pick up a pretty bottle in the supermarket and not really think about what's in our food. (Hey, I do it too!). And while raw eggs and smashed-up little fish don't exactly sound appetizing to me, I will admit to loving the dressing and looking far and wide for fish-free versions, even when I ate eggs. This dressing, while possibly not spot-on for an authentic Caesar Dressing fan, is very close and has never disappointed unknowing salad eaters in my house. I realize there are several equally delicious Caesar recipes in popular vegan cookbooks; but this is my version, so of course it uses ingredients I have on hand, and generally seems easier to throw together - at least to me. Mash the garlic with salt using this technique (or put thru garlic press). Scrape into small bowl. Add capers and lemon juice and mash a bit more. Add the rest of the ingredients and mix well with a fork. Adjust tastes if needed. Some people prefer more cracked pepper, more lemon juice or more olive oil. It's up to you and it's ALL yummy! *If you have it, a pinch of India Black Salt adds a nice, authentic "eggy" touch to this dressing but it's NOT necessary. Wash and dry a couple 'hearts of romaine' and tear or chop into small pieces. Add lettuce to a large salad bowl. Toss with the amount of dressing you prefer, until the dressing is clinging equally on all the leaves. Serve with fresh ground pepper and your favorite croutons, and some vegan Parmesan if you have it. Really!? I can see thinking it is vegetarian, but vegan?! If anyone thinks Cesar dressing is even close to vegan they are...well, I don't know what, lol! Anyway, like you I love the stuff, so I can't wait to give your version a try! I have yet to make my own caesar dressing, but I really should try it out! Thanks for the inspiration! sounds great! 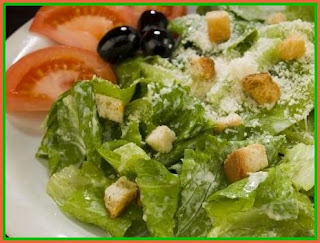 I love Cesar salad and have been looking for a good vegetarian version.